Taken Banksy is withdrawn from sale Jump to media player A Banksy artwork which was taken from a London street and had been listed for auction in the US has been withdrawn from sale. Anger over missing Banksy artwork Jump to media player A celebrated piece of work by street artist Banksy has found itself on the other side of the world in a Miami auction house. 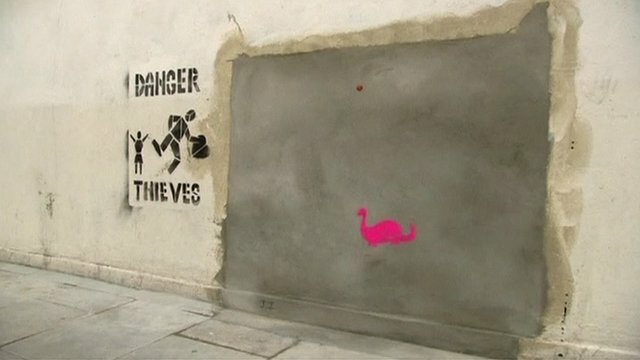 A Banksy artwork which was taken from a London street and had been listed for auction in the US has been withdrawn from sale, the BBC has learned. 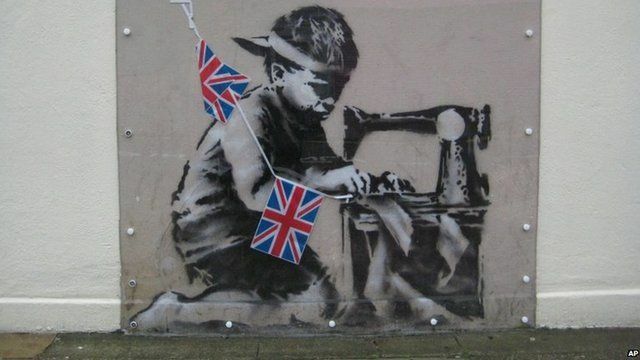 The Banksy mural, depicting a boy hunched over a sewing machine making Union Jack bunting, disappeared from Whymark Avenue earlier this month. It had been expected to be auctioned in Miami on Saturday but the auction house told the BBC the sale was halted.